Just in case you haven't been keeping up with news via our Blog, these are the results from shows this year. Another long gap between updates. Once again the answer is that we've posting all our news on the Strickley Blog - see below for link, or click the button on the home page. If you've been keeping up with our Blogging, you'll know we have a new weather station. As well as updating the weather page on this main site - see link on left and on the home page - it sends updates to our Blog, to WOW, and now three times a day to Twitter. One of my aims in the next few months is to redo the Shorthorn pages - so watch this space. 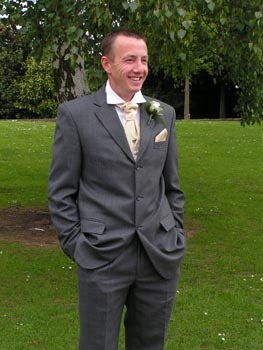 Apologies for the lack of updates in this section - we have been posting all the Strickley news on our Blog - click on the link above, or use the url http://strickley.blogspot.com/, and save in favourites. 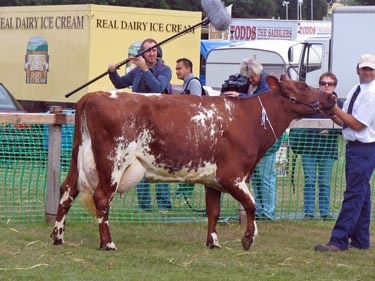 The showground has been rearranged this year, with more space for the cows (and us) than we've ever had, and by moving the cattle classes to the main ring, the public have a chance to see what an agricultural show is really about. The stewards were determined to keep to the timetable and kept the classes moving with no gaps in between. The judge Gwndaf James from Ceredigion had some strong classes to judge and seemed to like the Strickley stock. Once again the sideboard has filled up with silverware. Having suffered with the rain and waterlogged field last year, Grayrigg Show relocated for this year to Kendal Auction. Best group comprising newly calved cow or heifer, in-calf cow or heifer and yearling heifer. As usual there was a good turnout from the Dairy Shorthorn breeders (9 of them bringing 38 animals between them). There's always a good entry for the calf classes as the main Shorthorn classes are followed by the North of England Calf Show. We hadn't taken any calves this year, but 6 cows and heifers. I'm sure you will have seen and heard about the demise of Dairy Farmers of Britain and there's little to be gained from reiterating it here. We are now with another buyer - OMSCO and are reasonably hopeful about the future. But, we've said that before. At last a show free from rain, though the Society had put a lot of time, money and effort in ensuring that stock, trade stands and cattle could get on (and off) the Showground. There was a good entry in the Dairy Shorthorn classes and the new larger tent was much appreciated. The cows had room, there was room to keep all the feed and showing paraphernalia, as well as room for Team Strickley to sit and eat and watch the world go by. This was cancelled at the last minute as the field was so waterlogged. The On Farm classes had already been judged and we won the cup for the Best Dairy Herd. 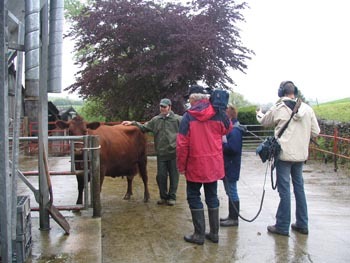 James took five cows and heifers to the Royal Lancashire Show, in great anticipation of a good show. But, bad luck seems to head Lancashire's way. The cows were all bedded down in the cattle tent on Thursday night and the handlers relaxing before the big day tomorrow, when word came that there would be no public allowed in. The field was so waterlogged that it had been deemed unsafe. The Cattle classes went ahead as planned on the Friday, but by then all of Saturday and Sunday were also cancelled. With no spectators, apart from other breeders, the Grand Parade and Prizegiving were also cancelled. But we weren't too downhearted; there were four exhibitors there and we came away with a collection of rosettes. The cups will be delivered later, and I hope to have some photographs (of cows, not cups) in the next few days. After two years of Conversion we are now 100% Organic. The first tanker load of organic milk has already left the farm. 33 in milk cows and heifers, maiden heifers and calves. As Penrith Show was cancelled, The North of England Calf Show was held at Strickley. and adjusting to life with a new baby. For even more up to date news - read our BLOG! 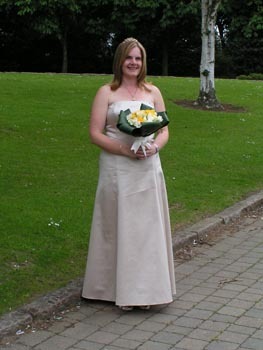 Robert & Claire had a baby girl in Chesterfield hospital at 11:30 am. Isabella Beatrice - 9lb 15oz! Mother and baby (and father) are doing well, and are back home in Belper. cows are obscured by the hoards of show goers sheltering from the downpour. The Shorthorn Champion was from David Dent's Winbrook herd, and Strickley Pansy (see Cumberland Show) was Reserve. were going to be there filming "Best in Show" - a project that started for us on 26th May - see below. and to record the happy faces at the end of the day. The programme was broadcast on Sunday 3rd September at 6 o' clock - and fortunately wasn't as embarrassing as we had feared! Up even earlier than usual. A very hot day, but we could take shelter from the heat in the new Cattle Tent. Click on the thumbnail to take you to photographs of shows. We started our Organic Conversion! 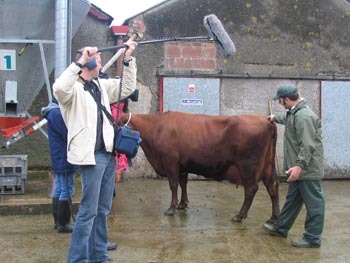 Friday 26th May 2006 -Lights - Camera -Action! 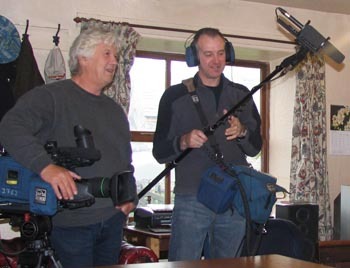 A team of three (reporter, cameraman and sound engineer) spent two hours with us, filming footage for a programme to be shown on Border TV later in the year. They are making a series of six programmes called "Best in Show". And as far as we understand it, each one is centred on one show (mainly agricultural) in the Border region. They are spending some time with an exhibitor from each show before the event, and then following it up at the show itself. 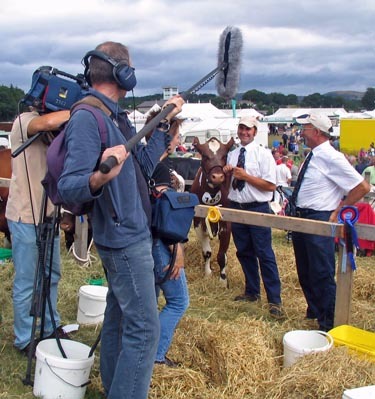 We were kindly "volunteered" by the secretary of Cartmel Show as we have been going there for many years. 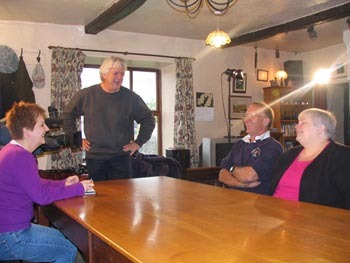 After an introductory talk Henry and myself (Kathleen) were asked to talk about the family and farm history and why we keep Shorthorns, while trying to sound natural and ignore the camera, lights and microphone. There was much discussion what to do about the ticking of the grandfather clock. The reporter liked the sound of it, but the sound engineer thought it might be too loud. So in the end we compromised - stopped the clock, and filmed our bit without it. We then started the clock and they took a recording of it ticking (to be added to the film later). They also recorded some silence! In case we never make it to the screen, we took our own photographs to prove it did happen. Both James and Fillpail were naturals in front of the camera. James explained what judges look for and how we prepare the cows for showing. 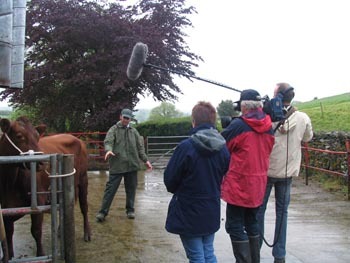 The Border team also filmed our young calves and cows out in the field. How much of this two hour session makes it to the screen remains to be seen (Very little I expect as it's only a half hour programme). 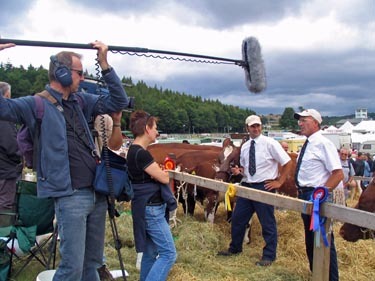 The likely transmission date is Sunday 5.30 pm two weeks after Cartmel Show (2nd August) - but watch this space!